A 6 person shooting drill. X1 and X2 take off, exchanging a puck to the far blue line. At the far blue, the puck needs to be with X1. X1 drives down the wall and cuts back. 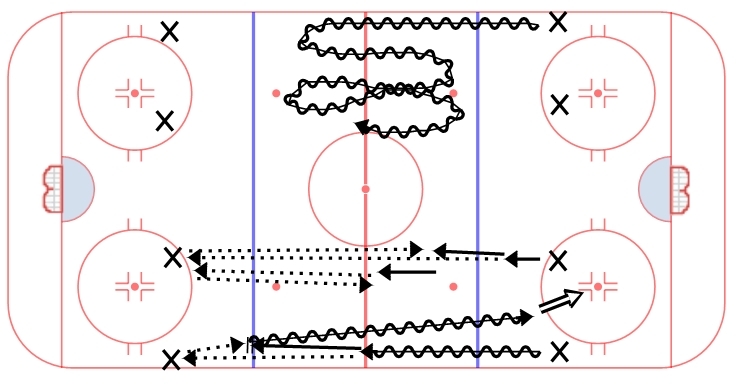 X2 loops through the middle of the ice and heads down to the other end to receive a pass from X1. Meanwhile, X3 has skated up to the redline and looped back in to take a long shot from center. X3 then goes in to the corner to pick up a puck. After X1 passes to X2, X1 high rolls around the top of the circle and receives a pass mid-slot from X3. There are a number of timing elements in this drill that require proper execution for it to flow right. All six players need to be moving with speed and intensity, sprinting to spots to make sure the passes and the shots arrive at the proper time. X3 needs to release the first shot, X2 needs to get on his/her horse to get into position and X1 needs to execute a tape to tape pass. 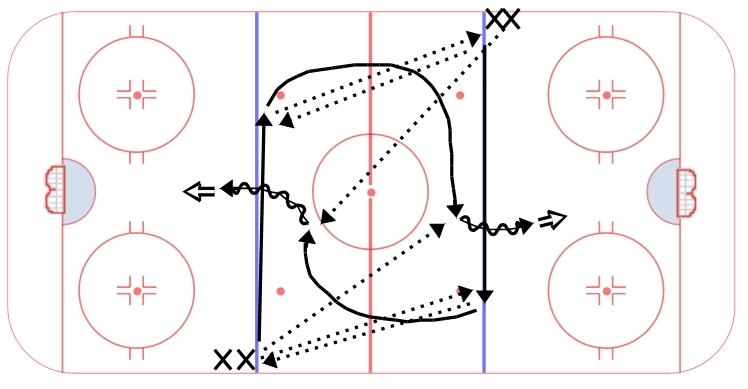 This drill is a good warmup drill that gets a lot of bodies and pucks moving while also working on passing and timing. A drill we do often at the beginning of practice. Four lines at the hash marks or at the top of the circles. There is a four step progression to this drill. 1. All eight players leave with a puck at the same time and stickhandle in the neutral zone. On the whistle they pass back to their lines and the next person goes. 2. Pass/follow your pass. One side will take off, exchanging with his partner on the far side of the ice while skating towards him. Try to get in as many passes as possible. When he gets to the far side, the first person in the other line goes the other direction. 3. 2v0 passing. 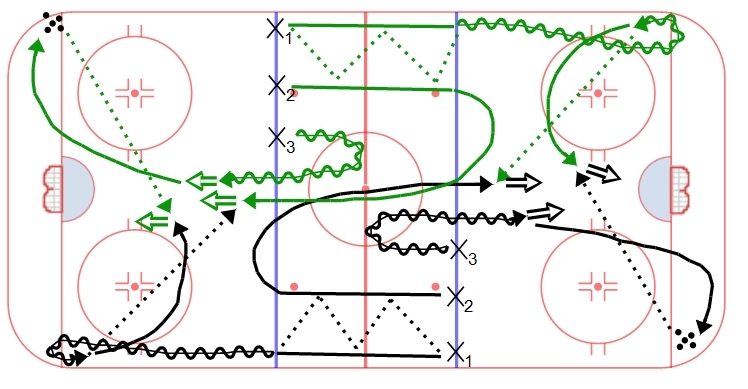 Two players on one side of the ice (in this diagram the top and the bottom would pair up) pass 2v0 until they get to the far line, then they exchange with the far line and go back – 2v0 down and 2vo back. 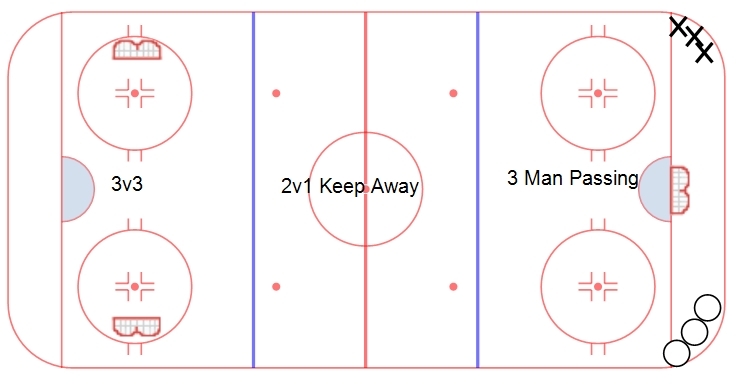 As soon as the far line gives them a puck to go back, those two players take off 2v0 to make it continuous. 4. Long shots (bottom of the diagram). One player skates to the red and passes the puck to the far line. He sprints to the far blue, receives the puck back and then goes in for a long shot on net. The lines stagger their starts, so the next line doesn’t leave until the player to his left hits the red line on the way down. The player on the far side takes off as soon as he gives a pass back to the player coming towards him.